Oh, what a concern for your Son you expressed! You sought Him and joyful You found Him in there. "They're wanting, my Jesus, the wine of sheer gladness." Oh, give them the wine of pure grace and pure bounty. They will, then, your Kingdom of justice e' er seek. "Whatever He tells you, in earnest, perform it." Assurance you won't have of greater fulfillment. Oh. help us to listen, whenever He speaks. Delighted we make it our duty and glory. In chorus confessing, God Triune we praise. Ave Maria! Ave Maria! Ave, Ave, Maria! Feast Day of Mary, Mother of Divine Providence is on Saturday before the Third Sunday of November. For more information about devotions please log to Mother of Divine Providence. There is a close relation between the Holy Eucharist and vocations to the priesthood and the consecrated life. vocations to the priesthood and the consecrated life. -Historians dispute about the origin of the 40-hour Devotion. Did it originate with St. Anthony Mary Zaccaria and the first Barnabites? Or the Augustinians? 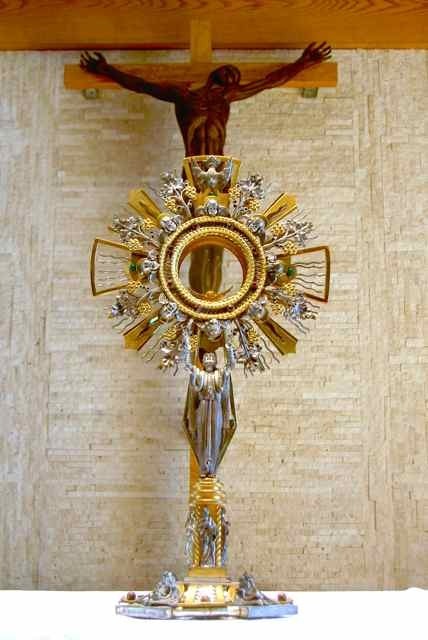 -The practice of private adoration of the Blessed Sacrament reposed in the tabernacle for a period of 40 consecutive hours, from Good Friday to Easter morning, existed before the time of St. Anthony Mary Zaccaria. -What Anthony Mary Zaccaria and the early Barnabites did in 1534 – 475 years ago - was to ask the authorization the expose publicly and solemnly the Blessed Sacrament for 40 hours in the Cathedral of Milan and to repeat that solemn exposition in turn in all the churches of Milan. The authorization was granted in 1537 and the practice took place for the first time from March to October 1537.